Compliance with the USEPA and the World Health Organization’s maximum contaminant level of 10 parts per billion for arsenic impacts thousands of water systems throughout the United States and other countries around the globe. The dangers of arsenic are masked by its colorless, odorless appearance. It is a carcinogen that occurs naturally in groundwater and is known for leading to dangerous health conditions such as cancer and heart failure. 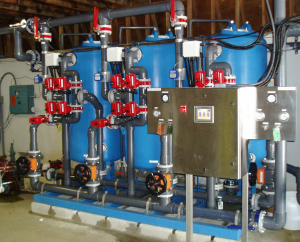 AdEdge offers a line of packaged, pre-engineered APU systems, which are the ideal solution for public water systems, schools, subdivisions, and more. We also have a line of modular treatment systems that arrive unassembled, ready for hook-up when they are installed on site. These solutions can incorporate the absorption, oxidation/filtration, and/or coagulation/filtration treatment processes with pre-and-post treatment for a complete integrated system. Why should you choose AdEdge for your arsenic removal needs? AdEdge participated in 12 successful USEPA arsenic demonstration projects. AdEdge has over 400 arsenic treatment systems throughout the world. AdEdge offers a range of treatment options to meet your treatment needs and goals. Independent studies have proven AdEdge’s Bayoxide® E33 adsorption media to be the highest performing technology for arsenic removal. All treatment technologies are NSF 61 certified. Click here to contact us or fill out a site profile form and we’ll start working on a customized solution for you. Note: Bayoxide® E33 is a registered trademark of LANXESS Deutschland GmbH.